The Great Depression was a long and extensive economic crisis, affecting most developed nations in the early and mid-1930s. It was triggered by a stock market crash in New York City in 1929, then soon spread beyond the United States, crippling the economies of dozens of nations. The impact of the Great Depression was particularly severe in Germany, which had enjoyed five years of artificial prosperity, propped up by American loans and goodwill. Unemployment hit millions of Germans, as companies shut down or downsized. Others lost their savings as banks folded. The dire conditions of the early 1930s led many German voters to abandon mainstream political parties and look to more radical alternatives, such as Adolf Hitler and the Nazi Party. The prelude to the Great Depression was an economic bubble in the United States, caused by years of prosperity and inflated confidence. The 1920s had been a boom decade for American companies, which tallied up record production figures, skyrocketing sales and millions of dollars profit. These profits were passed onto shareholders, who also benefited from sharp increases in share prices. Thousands of Americans rushed to take advantage of the share market, many using their life savings or borrowing against their assets to take advantage of the boom. But the dramatic increases in profits and share prices could not be sustained forever. By 1928 there was considerable over-production in many industries, leading to declining sales and falling profits. The bubble burst on October 24th 1929, later described as ‘Black Thursday’. Share prices on the New York stock exchange began to fall rapidly, sparking a rush of selling. As more stock went on the market, share prices plummeted – which led to further panic-selling as shareowners rushed to minimise their losses. This downward trend continued for three weeks, with share prices falling each day. The economic and social effects of the Wall Street crash were disastrous. Between 1929 and 1932, American industrial production fell by 45 per cent. Many companies were bankrupted or ceased trading; those that stayed in business released workers to cut costs. The most visible outcome of the Depression was mass unemployment. By 1932, more than 12 million Americans – or 24 per cent of workers – were out of a job. The collapse in economic confidence also led to runs on banks, as people rushed to withdraw cash. Hundreds of banks closed and many lost their savings and pensions. The Great Depression had profound effects on American society – but the impact on Weimar Germany was even more dire. Germans were not so much reliant on production or exports as they were on American loans, which had propped up the Weimar economy since 1924. These loans ceased in late 1929, while many American financiers began to ‘call in’ outstanding foreign loans. The German economy was not resilient enough to withstand significant withdrawals of cash and capital. Banks struggled to provide money and credit, and consumers lost confidence in them. In 1931 there were runs on German and Austrian financial institutions and several major banks folded. German industrialists had enjoyed prosperous times in the mid- to late-1920s, thanks to foreign loans and investment. But by the early 1930s, there was little demand for their products, while capital and credit were almost impossible to obtain. To compound the problem, the United States – at that point the largest purchaser of German industrial exports – put up tariff barriers to protect its own companies. German manufacturers consequently endured a sharp downturn in export sales. Many factories and industries either closed or downsized dramatically. By 1932, German industrial production had fallen to just 58 per cent of its 1928 levels. The effect of this decline was spiralling unemployment. 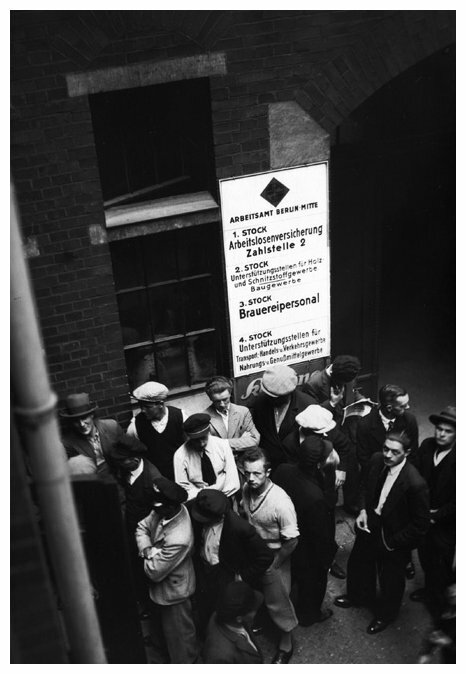 By the end of 1929 around 1.5 million Germans were without a job; within a year this figure had more than doubled, and by early 1933 a staggering 6 million (26 per cent) were out of work. The Weimar government failed to respond effectively to the crisis. Heinrich Bruning, who became chancellor in March 1930, feared inflation and budget deficits more than unemployment. Rather than spending to stimulate the economy and create jobs, Bruning opted to increase taxes (to reduce the budget deficit) then implemented wage cuts and spending reductions (to lower prices). Bruning’s policies were rejected by the Reichstag – but the chancellor had the support of President Hindenburg, who issued them as emergency decrees in mid-1930. Bruning’s measures failed, and probably increased German unemployment and public suffering rather than easing it. They also contributed to further government instability and bickering between Reichstag parties. 1. The Great Depression was an economic slump sparked by the collapse of the New York stock exchange in 1929. 2. It devastated the US economy, caused unemployment to soar and created significant social suffering. 3. It hit Germany after US financiers halted or withdrew loans, fatally undermining the German economy and industries. 4. By 1933 more than 6 million Germans were out of work, while many families struggled to afford food. 5. The Weimar government’s response to the crisis was ineffective, and probably even worsened its effects. J. Llewellyn et al, “The Great Depression”, Alpha History, accessed [today’s date], https://alphahistory.com/nazigermany/the-great-depression/.